No incumbents won reelection to state constitutional office in the November 6 election because none were running. When the votes were counted, party control of no constitutional office changed hands. Republicans remained ensconced in the governor's and the secretary of state's offices. Democrats continued in the offices of attorney general, comptroller and treasurer. Nor did change sweep the other branches of state government. Democrats maintained their four-to-three edge over Republicans on the Illinois Supreme Court. Likewise, Democrats maintained their majority in the Senate and added to their margin in the House. To characterize the election results as new faces but the same old parties is simplistic. The campaigns, particularly the governor's race, were marked by ventures outside of traditional party ideology. Democrats talked like Republicans and vice versa. The strange campaigns produced some strange returns. Democrat Atty. Gen. Neil F. Hartigan ran for governor on the Republican theme that spending must be cut. His assertion that taxes are too high won him votes downstate and in the suburbs. But the traditional Democratic political base deserted Hartigan as Chicagoans stayed away from the polls in large numbers. Blacks were unenthusiastic about Hartigan since he supported Cook County Assessor Thomas Hynes' 1987 attempt to unseat Mayor Harold Washington. All Chicagoans were confronted with a complex and confusing ballot after the U.S. Supreme Court restored the all-black Harold Washington Party to the ballot 11 days before the election. Unofficial totals gave Hartigan 421,000 votes in Chicago. He ran 50,000 votes behind Comptroller-elect Dawn Clark Netsch and Treasurer-elect Patrick Quinn and 40,000 votes behind Atty. Gen.-elect Roland W. Burris in the city. Not even a stronger than expected showing in the Chicago suburbs and downstate could carry the day for Hartigan. continuation of the income tax surcharge that is set to expire on June 30. Edgar announced in July of 1989 his support for making the temporary hike permanent. Hartigan came out early (in March of 1990) against continuation of the half of the surcharge that goes to local governments; he came out late (in September) against extending education's half of the surcharge. Edgar began the summer with a 20-point lead over Hartigan in some polls. Hartigan's attacks on Edgar's surcharge position reduced the margin. The attacks both struck a responsive chord with voters and increased Hartigan's name recognition. Hartigan moved upward in the polls throughout the summer, then held steady. By Labor Day the campaign was a horse race: by Election Day it was a dog fight. Edgar defended himself by attacking Hartigan's credibility. Edgar maintained that the surcharge was needed to provide money for education. He questioned Hartigan's commitment to schools. He condemned Hartigan as a cog in the Chicago Democratic machine. Together the candidates spent nearly $20 million to flood the television and radio airwaves with their messages. Other races ended differently than had been anticipated a year ago. At the top of the ticket Democratic incumbent Paul Simon waltzed to victory in the U. S. Senate race. Simon led the Democratic statewide ticket, besting Rockford-area Republican Congress-woman Lynn Martin by more than 900,000 votes. Martin, seen at one time as a formidable challenger, never got her campaign on track. Her effort to convince voters that Simon was out of touch with Illinois voters backfired. Her early attacks on Simon failed to knock down his standing in the polls, and she ran out of money. Resentment over President George Bush's reversal on new taxes swept the nation and hurt her further. The race for attorney general started slowly, with Comptroller Burris, the Democrat, ahead on name recognition. The race tightened at the end, but Burris held on to move two notches up the state constitutional officer ladder by besting DuPage County state's attorney Jim Ryan. Burris, the state's only black constitutional officer, saw his early lead in the polls narrow as Ryan hit on Burris's lack of prosecutorial experience in a late media blitz. Burris carried Chicago by roughly 300,000 votes; he lost in suburban Cook and the five collar counties by the same 300,000-vote margin. But Burris, a Centralia native who lives in Chicago, parlayed his downstate roots and name recognition into an 80,000-vote victory downstate, his ultimate margin of victory. In the secretary of state's race a late surge carried another Ryan — Republican Lt. Gov. George H. Ryan — to victory. Ryan and Treasurer Jerry Cosentino conducted one of the most spirited campaigns. Cosentino had led throughout, despite revelations that he had moved a portion of his trucking firm to Indiana to avoid Illinois' higher workers' compensation insurance rates and had received bank loans for his business after putting state money in a Chicago bank. Over the same period Ryan was accused of finding jobs for his relatives on state payrolls and channeling money for the promotion of international trade into contracts with his associates. However, an 11th-hour set of allegations that a loan from a bank to Cosentino's trucking firm had been routed through a third party appeared to doom Cosentino. Republicans made hay out of the late breaking news that a grand jury was investigating Cosmopolitan National Bank, which made the loan. In the comptroller's race Sen. Dawn Clark Netsch (D-4, Chicago) overcame an early deficit to pass Sue Suter and win by 240,000 votes. Suter had tried to paint Netsch as a supporter of tax increases. Suter had also touted her experience running the Department of Rehabilitation Services and the Department of Public Aid. Netsch in turn attacked Suter's record. The Chicago senator borrowed money and aired a series of commercials that highlighted Auditor General Robert G. Cronson's criticisms of the financial management of the rehabilitation services operation under Suter. The late pushes that carried George Ryan and Netsch to victory did not materialize for Greg Baise in the race for treasurer where Democrat Patrick Quinn prevailed. Quinn was best known as the founder of the Coalition for Political Honesty, which pushed the successful Cutback Amendment that reduced the size of the Illinois House from 177 to 118 members, and as a proponent of numerous other populist crusades. Democrats whom he had often challenged. He won union endorsements, which together with the name recognition earned in his support for various causes carried the day. Only Simon got more Democratic votes in statewide races than did Quinn. The judicial elections, like the constitutional officers, changed the faces but not the parties. 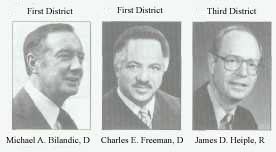 The election did produce the first black Illinois Supreme Court justice. Democrats maintained their four-to-three majority on the Illinois Supreme Court by winning two seats in the First Judicial District (Cook County). State Appellate Court Justice Charles E. Freeman, who is black, beat Republican Appellate Court Justice Robert Chapman Buckley to win the seat from which John Stamos, a Democrat, is retiring. Former Chicago Mayor Michael A. Bilandic bested Robert V. Boharic, a Cook County circuit judge, to hold for Democrats the seat held by Daniel P. Ward. Much closer was the contest to succeed conservative Republican Justice Howard Ryan, a Republican, in the Third Judicial District. James D. Heiple, a Republican appellate justice and former law clerk to Ryan, won by an unofficial 3,000-vote margin over Tobias "Toby" Barry, who served 14 years as a state lawmaker before being elected to the appellate bench as a Democrat. Not even the University of Illinois trustees' race, long the barometer of party strength, offered a conclusive picture of how voters were thinking this year. Democrats won two of the three seats on the board. Two incumbents won, but the board's most senior member was defeated. Returned to the board were Gloria Jackson Bacon, a black Chicago physician and a Democrat, and Susan Loving Gravenhorst, a Lake Forest advertising executive and a Republican. Tom Lamont, a Springfield attorney and a Democrat, bested 24-year board member Ralph Crane Hahn, a Republican from Springfield, to win a seat on the board. In the Illinois Senate the status quo was maintained, and Senate President Philip J. Rock (D-8, Oak Park) will continue to enjoy a 31 -to-28 advantage. In the most visible race Sen. Patrick D. Welch (D-38, Peru) turned back a challenge from Nancy Beasley of Sycamore, an aide to Rep. John Countryman (R-76, DeKalb). Republicans had targeted the race for the second time in four years, but Welch won by more than 7,000 votes. Democrats threw an election night scare into Sen. John A. Davidson (R-50, Springfield) when Bill Clutter, a Springfield alderman, came within 3,000 votes of upsetting the 18-year incumbent in the evening's closest Senate race. In the races for the Illinois House, the night was all Democratic. House Speaker Michael J. Madigan (D-30, Chicago) had gone into the election with a 16-vote majority (67 Democrats to 51 Republicans). After the votes were counted, he had picked up at least five seats and possibly six, depending upon the official canvass. The additional seats will strengthen Madigan's hand in dealing with Gov. Jim Edgar and will allow House Democrats to override gubernatorial vetoes. They will also strengthen Madigan's control over the House. • 47th district: Freshman Rep. Anne Zickus of Palos Heights lost her seat to David B. McAfee, the mayor of Indian Head Park. • 52nd district: The third time proved the charm for Geoffrey Orbzut, a former Madigan aide, who defeated Rep. Linda Williamson. • 67th district: Republicans lost the Rockford seat left open by John Hallock's run for Lynn Martin's congressional seat, when Winnebago County Auditor Michael V. Rotello bested former county board chairman John A. Terranova. • 110th district: Rep. Ron Stephens of Troy lost his seat to Jay Hoffman, a Collinsville attorney who was making his second run at Stephens. • 115th district: Rep. Wayne Goforth was a surprise loser, falling to Terry Deering of Dubois, a coal miner. Still uncertain was the fate of Rep. Robert P. Regan (R-80, Crete), whose contest with John A. Ostenburg, Governors State University administrator, could turn on a canvass and possible recount. The final decision on an election challenge would be made by the 72 Democrats and 46 Republicans elected to the House. The House results prompted a challenge to House Minority Leader Lee A. Daniels (R-46, Elmhurst). Rep. Thomas J. McCracken Jr. (R-81, Downers Grove) announced on November 9 that he would seek Daniels' slot as the Republican leader. McCracken said that Daniels had failed to increase the Republican representation in the House in his eight years as leader. What the 1990 elections mean will be dissected in the months to come. A few things seem obvious. A Democratic gubernatorial candidate who runs like a Republican will fare better downstate and in the suburbs but must watch his Chicago base. Name recognition still counts for lots in the lesser constitutional offices. Senate President Rock can still beat back challenges in the Senate. And House Speaker Madigan continues to operate a well-oiled political machine.